You can borrow athletic equipment from the office? 11-4:45p Say "Hi" to Summer! Got Pix? Story Ideas? Send 'em In! Summer registration starts May 18, and Upper Noe is excited to introduce Tot Tennis on Mondays from 10:30 to 11 a.m. The Recreation and Park Department has modified tennis equipment, so the 4- to 6-year-olds will be swinging rackets scaled to size. For those who prefer to swing a bat, Junior Giants baseball is back. The free summer league is sponsored by the San Francisco Giants. It was such a huge hit last year that this year Upper Noe will field five teams for children ages 5 to 7 and three teams for children ages 8 to 10. Practices are one day a week and games are on Saturdays. 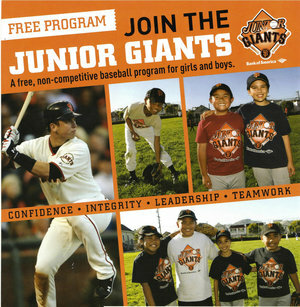 Junior Giants get to use equipment provided by the San Francisco Giants, including a pitching machine and uniforms. New this term for adults will be Pastry Arts, taught Thursdays from 6 to 8 p.m. by our own French pastry chef John Rutheford. Rutheford will start with basics like knowing ingredients and proper mixing techniques. The baking begins with pie crust and cookies and goes to tarts, breads and rolls. At the end of the eight-week class, students will bake a cake. Rutheford said the class will continue past summer, and he will adjust the menu for the seasons. He will also continue to teach Food in Jars on Wednesdays from 6 to 8 p.m. and Petite Bakers on Tuesdays from 10:15 to 11:45 a.m. Unfortunately, Express It will not be offered this term. The children’s movement class was slated to move to a morning slot to better attract students, but the teacher was unable to keep the commitment. Boot camp, senior tango, teen theater---all the usual favorites will be offered. To see a full list of classes and the open auditorium and gym hours, please click here. You must have a Family Account to register online. Click here to create a Family Account. Scholarships are available for those who qualify. Visit the department’s scholarship page. Catch The Improbabilities, an all-acoustic Americana band with the driving force of three fiddles at the May 18 Tot Rock concert at Upper Noe from 10 a.m. to noon. Fiddlers Kerry Parker, Tony Phillips and Catherine Rose Crowther will be joined by Rodney Freeland on mandolin and Dave Krinkel on guitar. Upper Noe's free monthly tot concerts are hosted by Friends of Noe Valley Recreation Center. It's hard to believe it’s been five years since Upper Noe’s 2008 renovation, but it will be easy to help mark the anniversary with a party that brings together community groups with neighbors, new and old. Yep---with your help we’re going to host Cinco de Noe, a Labor Day weekend blowout party featuring food, music, dancing, games, and sports, plus tables for nonprofit organizations. Friends’ Chris Faust is leading the effort and has already submitted a grant application to The San Francisco Parks Alliance. SFPA, the nonprofit partner of the Recreation and Park Department, is giving out $20,000 worth of grants up to $2,000 each. Winners will be announced in late May. We hope to get money to pay for permit fees, advertising, music and additional staff. We’ve also asked for benches for the shaded path along Day Street that connects the dog run with the rest of the park and a picnic table for the back patio behind the building on the Sanchez Street side. We need volunteers to get this party started. Interested in helping? Contact us at chris@noevalleyreccenter.com. Carin O’Hara doesn’t live in Noe Valley, but she’s serving a term on Upper Noe’s citizen advisory board. Why? Well, for one thing, the manager of K9 Scrub Club on Church Street spends more time at the shop than at home. O’Hara already knows many neighborhood families and their dogs, making her an excellent representative on the Community Recreation Council, which advises Upper Noe on what kinds of programming to offer. She also knows the area merchants, and is working on getting donated gift cards as one way to lure more volunteers to the center. The CRC still needs one teen representative to join music man Richard Hildreth, dog run dynamo Chris Faust, FNVRC fearless leaders Kate Haug and Molly Sterkel, Fairmount Elementary parent Elizabeth Torres and dedicated neighbors Kim Nguyen-Ehrehreich, Rebecca Hopkins and Dave Hopkins. Look for more on each in future newsletters. The CRC, which includes site staff, meets the third Wednesday of every month. O'Hara aside, merchant representatives are still much needed! If you are interested in joining, please fill out the application on our website. What do you want to know about the Rec Center? What would you like to read about in the newsletter? Give us your story ideas, and we'll put an ace reporter onto the case. What about pictures? Send us your pictures---of kids, of dogs, of flowers---anything nice at the center. We'll throw them into the newsletter. Please direct all great ideas to webmaster@noevalleyreccenter.com, and we'll get in touch. This is Betty. 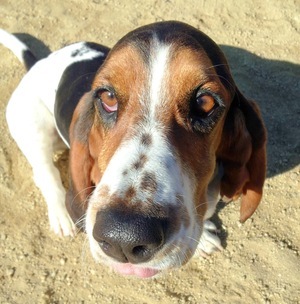 She comes to Joby's Dog Run for love!